Immunotherapy - the enlisting of the immune system to fight cancer - is an exciting new field that has already led to early trials of new treatments. However, these often fail because promising results seen in petri dishes are not translating into successful attacks on real tumors. Now, a new study from the Massachusetts Institute of Technology (MIT) suggests that one reason immunotherapy treatments appear to fail when they leave the lab may be because they are only enlisting one arm of the immune system. So far, immunotherapy developers have focused either on attacking tumors with antibodies, which enlists the innate immune response, or approaches like adoptive T cell therapy to boost numbers of T cells, which form the backbone of the adaptive immune response. In a report on their work in the journal Cancer Cell, senior author Dane Wittrup, a professor in chemical engineering, and colleagues describe how a combination of the two approaches successfully halted a very aggressive type of melanoma in mice. Their idea began as they were investigating how to improve the immune response of an antibody-based therapy using IL-2, a signaling molecule. Making IL-2 hang around longer boosts anti-tumor antibody therapy. 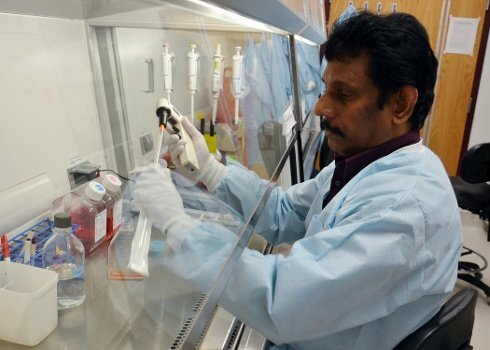 BLACKSBURG, Va., April 8, 2013 – A study at the Virginia-Maryland Regional College of Veterinary Medicine has identified a chicken-killing virus as a promising treatment for prostate cancer in humans.